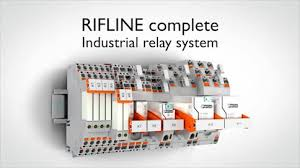 Phoenix Contact’s RIFLINE Complete is a one stop shop relay system. Why use multiple relay ranges when you can carry out all standard relay applications using just the RIFLINE Complete relay system? RIFLINE Complete is Phoenix Contact’s new cost effective modular ice cube relay series. The relays range from a slim 6.2 mm coupling relay to a small power contactor replacement. The most powerful relay can switch voltages up to 440 V.
Whether you want to isolate, multiply or amplify signals, it doesn’t matter as you will only ever need the one system. Phoenix Contact’s RIFLINE Complete can be assembled individually or ordered as a complete module. All components in the modular system can be ordered individually depending on the application. Phoenix Contact’s new RIFLINE complete relay system has been designed to implement all standard relay applications. Switch low currents and currents up to 16A, whether you want to replace small power contactors or whether you want to isolate, multiply or amplify signals, the field of application ranges from coupling to timer relays. RIFLINE complete relay system’s universal plug-in design supports quick, easy and error-free handling. The advantages of using this system is the availability as a complete or modular system, its reliability and it has a complete product range covering all standard relay applications. Thanks to its plug-in special function module, it is easy to extend to a timer relay. The system also boasts easy handling due to its modern wiring and potential distribution concept. All complete modules in the RIFLINE series are also available as modular systems and, as its been inspired by CLIPLINE complete, RIFLINE complete also offers an abundance of accessory components suitable for both systems. As individual components can be combined as required depending on each scenario, this benefit maximizes flexibility. Transform a relay module into a timer relay using the multifunctional plug-in timer module. RIF1 to RIF4 bases can be equipped with this module. Selection can be made from three time ranges and four time functions using DIP switches and using a potentiometer you can detail time settings. To enable quick, tool free wiring, use RIFLINE complete using its proved push in technology. Reduce wiring effort using plug in bridges and upgrading to a timer relay is possible using the timer module. Thanks to push in connection technology gives Easy Wiring. Using plug in bridges from the standard range of Clipline gives Easy Potential Distribution. With plug in multifunctional timer modules, gives Easy Expansion. For further information please get in contact. Phoenix Contact’s new RIFLINE complete relay system has been designed to implement all standard relay applications. Switch low currents and currents up to 16A, whether you want to replace small power contactors or whether you want to isolate, multiply or amplify signals, the field of application ranges from coupling to timer relays. RIFLINE complete relay systems universal plug-in design supports quick, easy, and error-free handling. The advantages of using this system is the availability as a complete or modular system, its reliability and it has a complete product range covering all standard relay applications. Thanks to its plug-in special function module, it is easy to extend to a timer relay. This system is also has easy handling due to its modern wiring and potential distribution concept. All complete modules in the RIFLINE series are also available as modular systems and as its been inspired by CLIPLINE complete, RIFLINE complete also offers an abundance of accessory components suitable for both systems. As individual components can be combined as required depending on each scenario, this benefits maximises flexibility.